This adorable and super soft, blue ear bunny hat is perfect for your little one's first photo shoot, to dress up for the spring season, or just to look darn cute. The ears actually stand up! 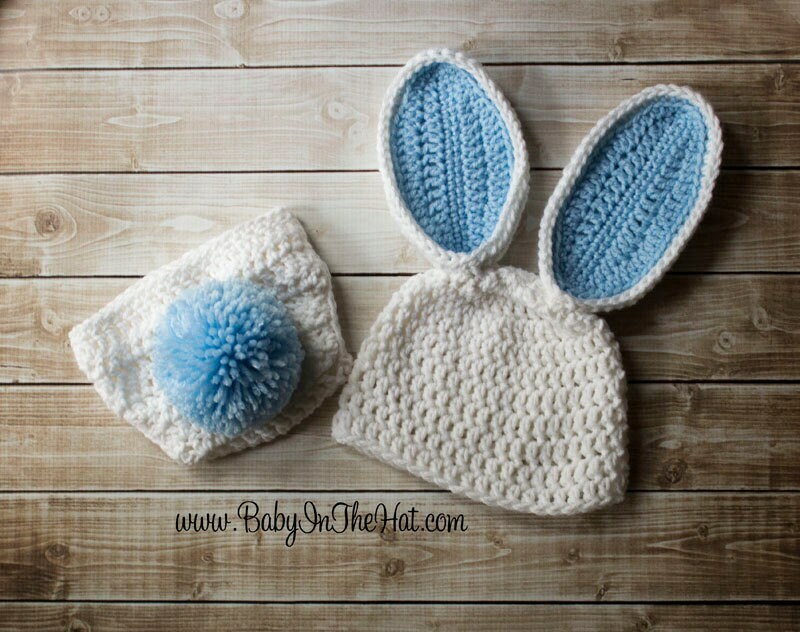 This set is hand crocheted using soft, 100% acrylic yarn. It will stretch yet still keep its shape. This item is available in a variety of colors. If you would like a different color please note during checkout, otherwise, the set will be made with the same colors as in the main picture. Please remember that colors may vary from screen to screen. This item is crocheted using soft, 100% acrylic yarn. It will stretch yet still keep its shape. This item is available in larger sizes by requesting a custom item. This set is made to order. Please check our shop announcement on current turnaround times. If you need it sooner, please contact me so that we can work on setting up a rush order. By purchasing this listing you are agreeing to my shop policies. Disappointed it did not arrive in time for the photo shoot. I would have paid more to expedite. Just what we needed material wise. I was hoping to receive white, tan, and army green cloths but got white, army green, and a bright green. It’s very hard to determine colors from the post. We ended up only using two of the three because of this. It is recommended that you hand wash in cold water with mild soap. Press out excess water with a towel, do not twist. Lay item flat to dry. Shape before wearing. Each item is made to approximate dimensions due to being hand made no two items are identical when it comes to size. I always do my best to be exact as possible. All items are general sized since most items made of yarn will stretch. Hats are made to fit the circumference of the head. Each measurement is inches around. Hats are sized to fit comfortably and a little looser than a traditional beanie. All items are shipped without an invoice to save on added waste. We wrap each item in a neutral paper color as if it was a gift for you and the precious little one that will be wearing it. If you would like a personalized note or more detailed wrapping please contact us. Many items we sell contain long strings, small parts, and/or buttons that can present a choking hazard, adult supervision is always recommended. Newborn items are listed as props and not intended for use without proper safety techniques while photographing infant with these items. Please always use practice proper safety when using props. All images and descriptions are the property of BabyInTheHat.com 2011-2019. They are not for any use without written consent. If you are caught using any material that is the property of Babyinthehat.com you will be prosecuted to the fullest extent of the law.